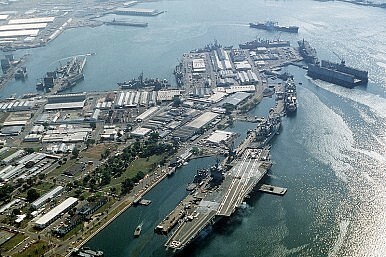 The former U.S. naval base at Subic Bay. Japan continues to be drawn toward the South China Sea. Japan joined a U.S.-led maritime humanitarian exercise off the coast of the Philippines, near Subic Bay, for the first time ever. The move comes as tensions remain high between the Philippines and China over the latter’s island-building and construction activity on disputed features in the Spratly Islands in the South China Sea. Additionally, the move comes as concerns grow in the United States about how Washington can best counter China’s moves in the South China Sea. Both Japan and the Philippines are treaty allies with the United States. According to Reuters, a Japanese Maritime Self-Defense Forces (MDSF) was in Subic Bay, the site of a former naval base, leading into the South China Sea. The Japanese vessel was involved in refueling “a U.S. Navy floating hospital en route to Vietnam for the seven-nation humanitarian mission.” The MSDF vessel’s participation comes just weeks after Japan flew a P3-C Orion maritime surveillance aircraft near disputed South China Sea features during a joint maritime exercise with the Philippines (the second-ever exercise between the two countries). Building on a defense pact between the two countries earlier this year, Japan and the Philippines held their first-ever joint naval exercises in the South China Sea in May. The most recent exercise in Subic Bay highlights the ongoing trilateral convergence between the United States, Japan, and the Philippines. Rear Admiral Charles Williams, the commander of the U.S. Seventh Fleet’s Task Force 73, in a statement to reporters, implied that this is part of a broader trend in the United States’ approach to the region: “You are seeing in exercises … a shift from strictly bilateral engagement to multilateral, which is why you see the Japanese here today.” The Subic Bay exercises are part of the U.S.-led Pacific Partnership series of exercises, involving seven states. Peter Paul Galvez, a spokesperson for the Philippines Department of National Defense, noted that “Admiral Kawano expressed interest in conducting more exercises with the Philippines in the future, particularly amphibious landing exercises and amphibious operations.” “Aside from defense equipment cooperation, Admiral Kawano stressed the importance of capacity building cooperation with the Philippines, particularly on matters concerning humanitarian assistance and disaster relief,” Galvez added. South China Sea: Philippine Navy Flagship Runs Aground at Half-Moon ShoalChina Deploys Long-Range Anti-Ship and Anti-Air Missiles to Spratly Islands For First TimeNew Photographs Show China's South China Sea Artificial Islands Like You've Never Seen ThemManila's Disappointing Reaction to the US FONOP Near Scarborough ShoalSouth China Sea: A Chinese 'Invasion' Near the Philippines' Pag-asa Island in the Spratlys?